We all have our own special Frank Rizzo stories. The guy was bigger than life in so many ways. I actually didn’t know how to react. I think I mumbled something like “yeah, that’s terrible.” And excused myself knowing the crew and I needed to get back on the road. Over the next two years, I covered a few more Frank Rizzo news conferences and events as he was heading towards his first run for Mayor. Along the way I also covered quite a few anti-war demonstrations in town. At one, protesters were amassed in a line of about 40 or 50 people chanting and waving signs complaining that the University City Science Center on Market Street was designing weapons for the military. One of the protesters was a college buddy of mine from my days at Franklin and Marshall. He was now getting a Master’s degree at Drexel. So I pulled him out of the line and began to interview him. As the interview progressed I noticed another camera lens in my peripheral vision – and it wasn’t my cameraman. I turned and saw what then was a very advanced video system, – a black and white video camera recording on to reel-to-reel half inch tape. The news crews all shot 16mm motion picture film. Portable video cameras were unheard of in 1969. I was intrigued by the technology and when I asked who the cameraman was shooting for, he explained that he was a cop. He said he was getting footage for training materials on crowd control. I found out who he reported to and arranged to do a story on police technology and crowd control. What I found was the police were using the tapes to identify anti-war protesters. They had a log book with the identity of every protest leader in town and from out of town. I asked to see the tapes of the great 1969 anti-war protest that nearly shut down the whole country. When they set the tape player’s counter to 0, the lieutenant in charge could tell me exactly who every protest leader was by matching the counter number to a reference in a police log book. Then I learned, they maintained files on everyone they thought might become a problem. Well, we do that today as part of our regular homeland security practice following 9/11. But then, it seemed like a huge violation of the constitutional right of assembly and free speech. What have we lost in the name of national security? Shortly after gathering that footage and starting to prepare a story on police surveillance, I received a phone call from the leader of a commune at Temple University that published an underground, anti-war newspaper called “The Free Press.” One commune member, David Kairys, recently a dean at Temple Law, filed a federal law suit against Rizzo aimed at stopping what they claimed was harassment. Indeed, police cars were parked outside stores that advertised in the newspaper. Worse, when they were about to release an edition that had a headline opposed to Rizzo’s potential run for mayor, the police attempted to hi-jack the entire press run. The paper’s front page had a “Stop Rizzo” headline, but the ‘z’s in Rizzo were spelled with swastikas. And the picture under the headline was the famous photo of the ‘big bambino’ with a nightstick protruding from the cummerbund of his tuxedo. But Rizzo’s nose in the photo had been replaced with that of a pig. As red cars (Philadelphia police cars were bright red in those days) halted the printer’s truck outside the commune’s apartment near Temple and as police tried to seize the entire press run, Kairys spoke up and cited the unconstitutionality of what they were attempting. The police backed off, but Kairys did not and finally filed his lawsuit. That sparked the most significant story I’d ever produced at WCAU. It was called “Rizzo and the Free Press.” It included the footage and interviews I’d developed over the police use of video tape to catalog anti-war protesters and concluded with a long interview with Frank in his office with the big wall sized police shield in the background. In it, he maintained that society had broken down to the point where police had to act pre-emptively to identify those who might someday, in some unknown future, commit crimes. Hence, files had to be maintained and the identities of those exercising their constitutional rights had to be known to police. When I pointed out to Frank the many instances of civil disobedience that had advanced our country from revolutionary times, through to civil rights gains, he dismissed those as if they didn’t count as part of the American story. In the interview, he actually came off as a fascist. It was a shame, because he really meant well. He really thought it was his job to protect his vision of America from those he thought were out to destroy it. With Frank, you were either with him or against him. Frank never forgave me. I never forgave him for having all four tires on my car slashed in the WCAU parking lot the very night that story aired – Sunday after football – in our highest rated news show, anchored by my dear friend, the late Bill Stewart. That night, Frank Rizzo decided I was against him. Advance the time line four years. I’d just left the station to pick up the reins of my new production company as a full time job. But I was helping my lawyer, Joseph Della Guardia, in his campaign to capture George X. Schwartz’ seat on City Council. Schwartz had made a few missteps in public at the time. Most of us knew the rumors that George was corrupt and the (now defunct) Evening Bulletin even ran an investigative series that led to the conclusion George was somehow getting kickbacks from developers as he controlled the Zoning Hearing Board and City Council’s Zoning Committee. My lawyer and friend Joe was gaining on Schwartz. Rizzo was invited by Joe to attend a rally at the Overbrook Italian American Civic Club – part of the district Schwartz represented. Joe asked me to arrange TV coverage. I called my friends at stations in town and the event was well covered on the 11 PM news that night. Afterwards, the Mayor’s chief of staff, Marty Weinberg asked me to join the mayor, Joe and some other city and political officials at a backroom dinner in the club. I told Marty that Mayor Rizzo really didn’t like me. Marty insisted saying it would be good for Joe. So there I am at a Formica-topped, long kitchen table surrounded by Rizzo’s cabinet, guys like Al Gaudiosi – the former Daily News editor turned deputy Mayor. There were a bunch of other Italian guys Rizzo had running various departments like Streets (trash collection), License and Inspections and the like. Joe Della Guardia was there. Marty Weinberg sat opposite me in the middle of the table, and Rizzo was at the head of the table. After a while Marty looks at Rizzo and says, “Mayor – that’s Jay Silber over there who arranged all our TV coverage tonight.” Silence from Rizzo. I motion to Marty to leave it alone, but he repeats himself: “Mayor, that’s Jay Silber over there who arranged all our TV coverage tonight.” Rizzo had steel gray eyes. And he turned them on me with a look I’ll never forget. “I remember Silber. He used to take shots at me when he was on TV. Now he’s on my side, heh, heh…” Think Darth Vader speaking of the power of the Dark Side. I wanted to shrink under the table and crawl away, just to avoid the stare if nothing else. A few weeks later, at an outdoor rally just outside Joe’s law office, Rizzo meets with Joe and me inside. He insists we all drink schnapps. We each have a shot glass. Rizzo proposes a toast to Joe’s success and we each throw back the shot in one gulp. Then he looks at me and says “I know it wasn’t really you behind those stories. It was that lousy leftist news director of yours – Barry Nemcoff. I know it wasn’t you.” What I wanted to say was Barry and I thought exactly alike on the subject of Frank Rizzo, and goddamn you for slashing my tires, but instead I mumbled something like “Yeah, I always liked you.” And that was true on one level. He was personable, and in his gruff manner, he could still be charming, and I knew he thought he was doing the right things to keep the city safe. He just had no real clue how unconstitutional and really un-American his actions often were. 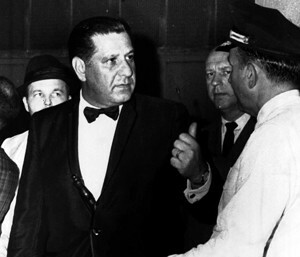 Joe Della Guardia’s campaign was working so long as Rizzo and Schwartz were political enemies and vying for control of the Democratic Party in Philadelphia. But Schwartz and Rizzo came to some agreement, and Joe was asked to drop out. Interestingly, the next week Joe was named Deputy Commissioner of Licenses and Inspections.